Remodeling is a great way to give your home a facelift. As a licensed remodeling contractor T & N Enterprise can easily update your kitchen with new cabinets, countertops and flooring. You'd be surprised at how much this will change your home; or replacing your old bathroom fixtures with a new tub/shower and surround. You'll love it. Updating the outside of your home is important too. Replacing the broken skirting or putting up new siding will make your home look new again. We also replace your awnings. As a remodeling contractor we strive to keep our rates in a very competitive range. We are a remodeling contractor that will give you your price estimate up front and you will always know what it will cost to complete your remodeling project. Give us a call. I bet T & N Enterprise can make your visions a reality. We are licensed, bonded and insured and our reputation is something we stand behind. We have years of experience and many happy customers with quality projects to show for it. Word of mouth referrals is where the majority of our business comes from. We offer superior quality craftsmanship. No matter how big or small, the job is not complete until our customer is 100% satisfied. We are a remodeling contractor that doesn't take any unnecessary short cuts and you can be assured you will get professional results at a reasonable price. With our tractor we can clear land. 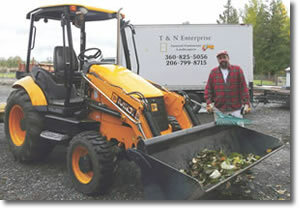 We are able to haul away any unnecessary debris. We have equipment for French drains, irrigation repair and installation. We install sidewalks, patios, rock walls, block walls and retaining walls. These are are all projects we can get completed for you. We have been asked, "Can you fix my roof while you're here?" The answer is yes, T & N Enterprise can! We are a licensed and bonded roofing contractor. We can repair or replace your roof. We install or repair composition roofs, shingled roofs and metal roofs. We are able to work on single family, manufactured home and mobile home roof systems. Let us fix your roof before that small leak becomes a bigger issue than it needs to be. Call today for the highest quality service!